The common cold has certainly earned its name: Adults catch two to four colds per year, and children can get as many as six to 10! Colds are extremely easy to catch — touching contaminated surfaces like doorknobs or keyboards, shaking hands or inhaling germs when someone coughs or sneezes are all ways to catch one. While there's no cure, there are plenty of things that you can do to help alleviate symptoms. The good news is that there are a lot of remedies to provide symptom relief at your local drugstore. You can even take certain steps to decrease the length of your cold — if you start taking zinc lozenges such as Cold-EEZE at the first sign of a cold, the zinc ions can stop the virus from replicating. It's important that you get the right OTC medication for your individual symptoms. Here are some tips on what works best for what, as well as some myths about these pesky viruses. 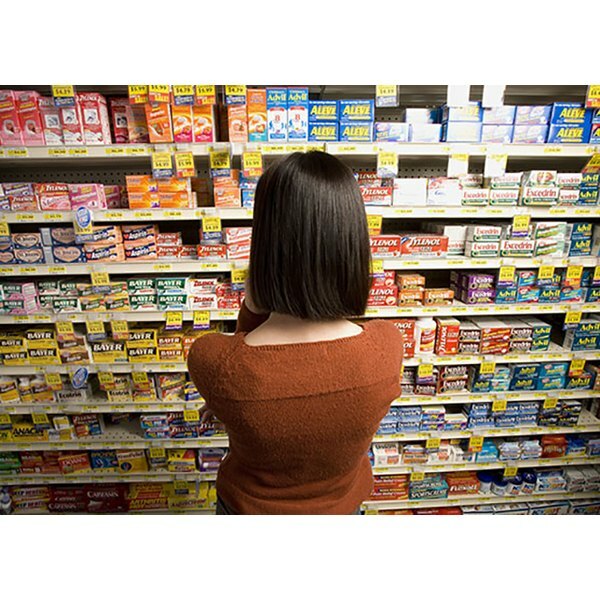 Decongestants Look for the ingredient pseudoephedrine. This works well to stop the production of mucus. But be aware that this type of decongestant can have significant side effects like increased blood pressure, jitteriness and insomnia. Saline spray At the onset of a cold, squirting saline into your nose will thin the mucus out and flush out the germs that got you sick. Look for one with purified water and sodium chloride. This is the purest version with no additives, and there are no side effects. Ibuprofen This ingredient reduces the inflammation in the back of the throat that's causing pain. Lozenges Look for drops with menthol or benzocaine, which are numbing agents. Saltwater gargles These disinfect the throat and provide relief. Dry, hacking cough Dextromethorphan. This is a suppressant that stops the cough reflex. Look for "DM" on the box. Wet cough Look for guaifenesin as an ingredient. This is an expectorant that thins the mucus to relieve coughing and to clear airways. Be sure to drink a glass of water with the expectorant to make it more effective. Water helps loosen congestion and lubricate the throat. Myth: I can only catch a cold in the winter. Fact: No, you can catch one year-round. While summer colds are less frequent, they do occur and are caused by a different virus than the typical rhinovirus we see in wintertime. Summer colds are caused by the enterovirus, which causes more severe symptoms, including stomach upset, headache and body aches. They can last longer too -- up to two weeks. Myth: Air-conditioning can cause a cold. Keep a summer sweater handy because rapid changes in temperature from going in and out of air-conditioning can increase your likelihood of catching a cold. How? When your body temperature drops, the blood vessels in your pharynx constrict, making you more susceptible to germs. Myth: Antibiotics can treat colds and flu. Although we wish antibiotics would do the trick, colds are caused by viruses, not bacterial infections, which is what these drugs fight off. Of course, the best thing you can do is to take steps to avoid getting a cold altogether. Be sure to wash your hands often and avoid touching your eyes, nose and mouth to prevent the spread of germs. Readers -- Do you catch summer colds? Are they worse than winter colds? How do you treat your symptoms — with OTC drugs or DIY alternatives? Leave a comment below and let us know! Dr. Keri Peterson is board certified in internal medicine and has been in private practice with a prominent medical group on the Upper East Side of Manhattan since 1999. She is a medical contributor and columnist for Women's Health magazine. A frequent media spokesperson, Dr. Peterson is a regular guest on The Today Show and has appeared on programs including Good Morning America, The Rachael Ray Show, The Tyra Banks Show, HLN, America's Newsroom, Fox 5 News, America's News HQ, Neil Cavuto, CNN American Morning and Nancy Grace_. _Additionally, she is a medical advisor for the health care website Healthination.com. Dr. Keri Peterson is board certified in internal medicine and has been in private practice with a prominent medical group on the Upper East Side of Manhattan since 1999. She is a medical contributor and columnist for Women's Health magazine. A frequent media spokesperson, Dr. Peterson is a regular guest on The Today Show and has appeared on programs including Good Morning America, The Rachael Ray Show, and more.